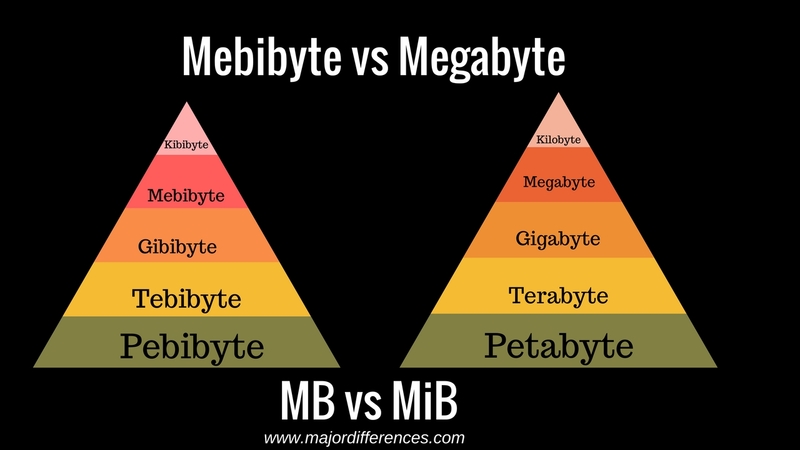 Both Megabyte (MB) and Mebibyte (MiB) are units of information or computer storage. But MB is used in two ways either as equivalent to 1000 Kb or 1024 Kb. This creates some sort of confusion. To avoid this, the International Electrotechnical Commission (IEC) (1998), the leading international organization for worldwide standardization in electrotechnology, approved as an IEC International Standard names and symbols for prefixes for binary multiples for use in the fields of data processing and data transmission. They recommended the use of Mebibyte (a combination of Mega and Binary) MiB, which always refer to 1024 Kb. See the table for percentage difference in storage size in MB and MiB. The difference is significant as the storage size increases. Mebibyte is exactly 1,048,576 bytes. Memory manufactures commonly use binary prefix or MiB. Most operating systems Ubuntu and Windows use mebibytes to report file and storage sizes. For Example, 500 GB drive is reported by the OS as "465.66 GB" (meaning 465.66 GiB).